Why sorrow you say? Two reasons. First, not getting to this story sooner. Second, not being their right now. 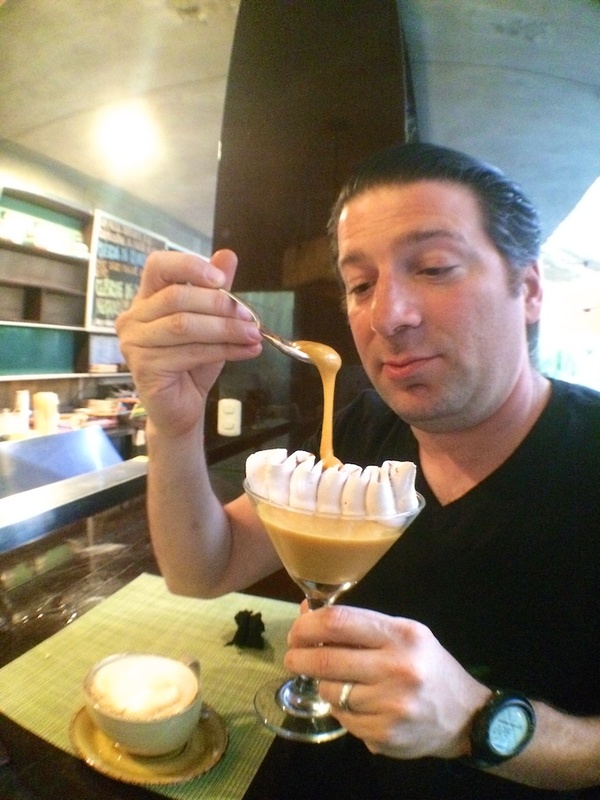 The food in Lima, as many have recently screamed from the middle of their 3 star michelin kitchens, blew my mind because of the immediate and aggressive foreign assault on my senses. Sparing just my hearing the rest of my system couldn’t make heads or tails for a good day from the sights, textures, tastes and smells pummeling me at each meal. But, let’s start at the beginning as all epic, gastro-adventures should. South America was on our list for a while. Having nailed Argentina and Brazil, Tony and I set aside two weeks to roam Peru. First stop, the capital city of Lima. A rough start had us sleep our first night in JFK because of some LAN Airlines mix up. When we finally arrived we quickly hopped a Green Taxi (which seemed more regulated than the other cheaper options) and headed to the Miraflores Hilton to freshen up before our 8pm Central Restaurante ressie. Despite the delays our plan to start the trip with a 17 course tasting menu meal was not foiled. We even had enough time for a quick walk to the Miraflores coast from our hotel. The grey overcast “It’s about to rain but rarely does” sky left us with a feeling of perpetual dusk. Eventually twilight turned into, evening and we arrived at Centrals non-descript front door on a mostly residential block. 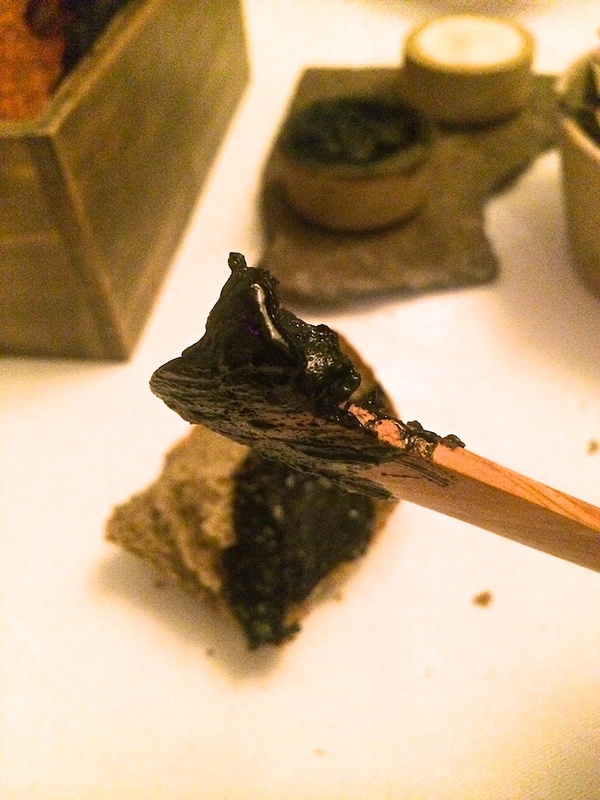 This black butter was the first thing that arrived at our two top in the lower level of this modern Amazonian designed 5 star mecca. Everything about the meal from this moment on was a first for me. By the time we had finished our seventeenth course I had experienced that wonder 8 more times. With menu explanations like frogfish and deep water algae OR algarrobo, mamey and palo blanco cacao I was sure of one thing, I was just schooled in the wonders of the Amazon. Post meal we strolled the streets of Miraflores, burnt off the calories and minor jet lag and recounted the bites with the excitement of having 13 more days to eat ahead of us. 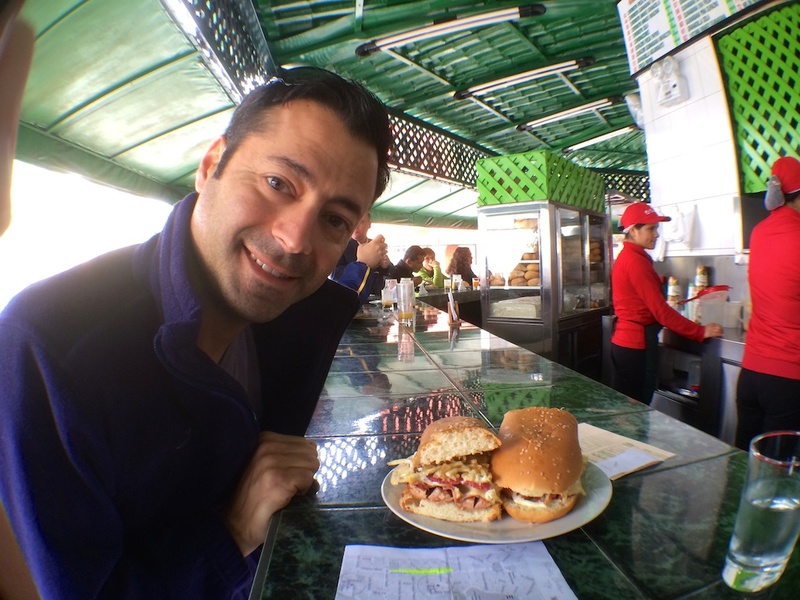 In the morning, after an elaborate, hearty, yet Americanized, breakfast, we met Raul in the lobby and headed to Surquillo Market. Raul was a new buddy our friend Jeff introduced us to a few weeks before wheels down in Lima. In our pre-trip email I mentioned the market is always our first stop as we try and understand the vibe of a new city. He immediately understood and suggested Surquillo because it’s not only one of the biggest and best but it’s near his favorite lunch ceviche spot. As we crossed the threshold through the giant stucco Mercado painted wall we felt South America loud and proud. As I always say about markets in other countries, the operations are more loose and less sterile than the United States. 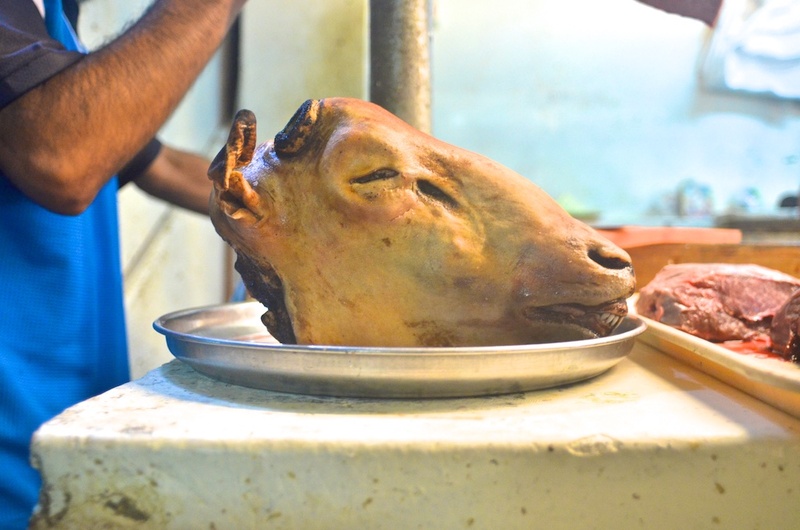 This is also what will make you sick but I will tip toe around that for the authenticity of the meat, cheese, fish and produce vendors. Pro tip: Pro-biotics. The circularly designed market had all our favorites for gaping and tasting. Immediately we were brought back to the Amazon we experienced the night before at Central. 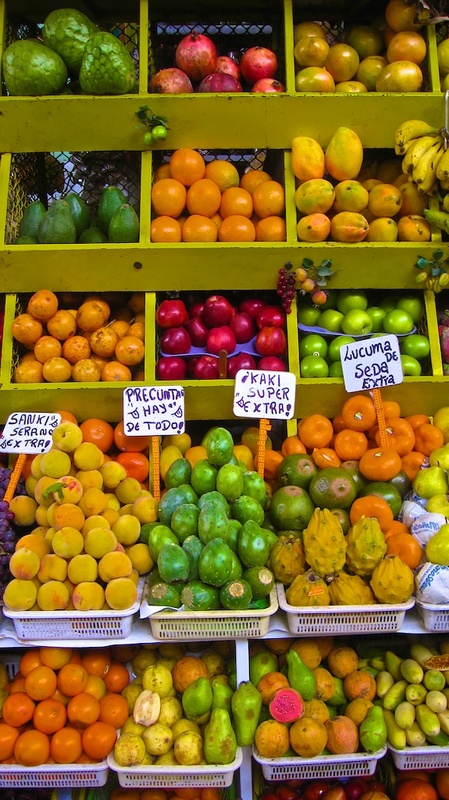 The fruits and vegetables were so diverse and unrecognizable that we wanted to cut open and taste everything. Luckily Raul and his wife Paloma helped translate and explain what each unique item was. By the time we made it to the meat section we were over-titillated. 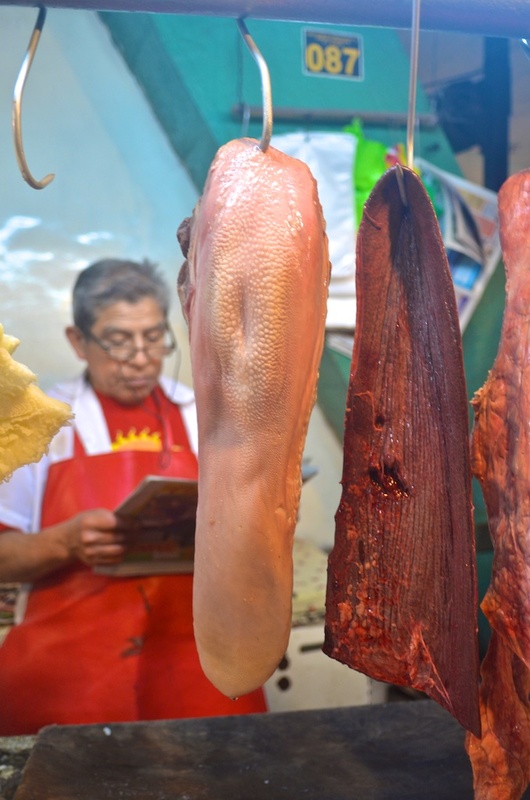 Hanging bovine tongues and testicles with an old Peruvian vendor reading the paper is exactly the scene I mean when I say the market is the heart of any city. And yes, he sold cow heart too. Excuse me, anticuchos. 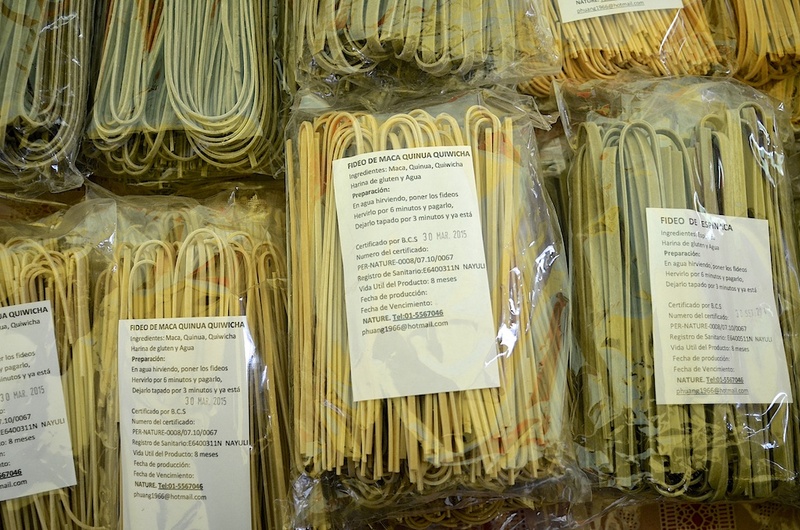 We hit a specialty area and found this quinoa pasta. Not expected but welcomed. 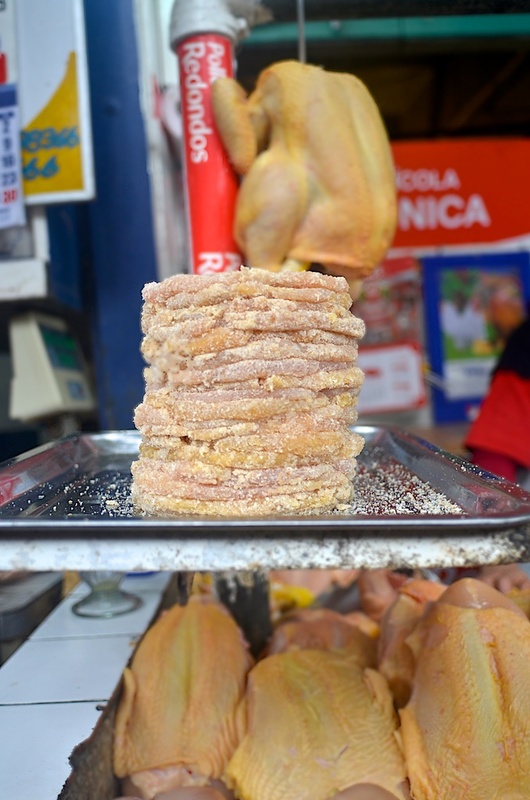 It shows that the gastronomical revolution in Peru is preparing to go international as well as hit the palates of locals. 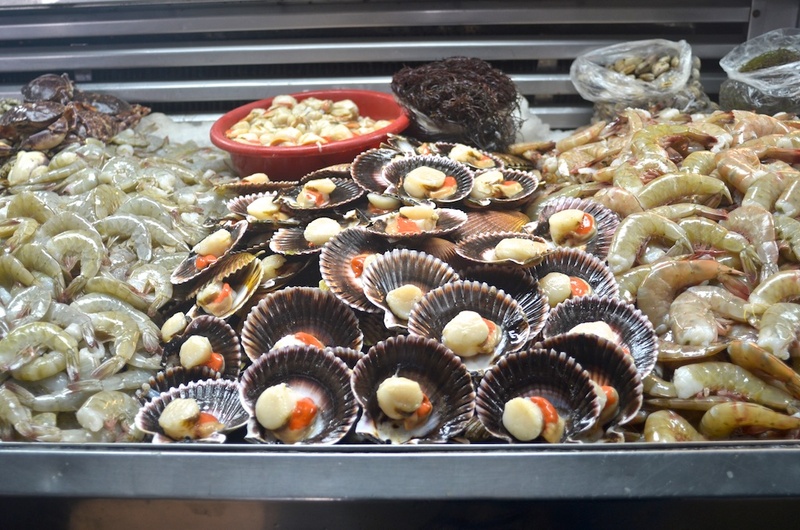 During our entire trip in Peru I never saw or ate a scallop that didn’t have roe. I’m still not sure how this is possible but it is delicious. 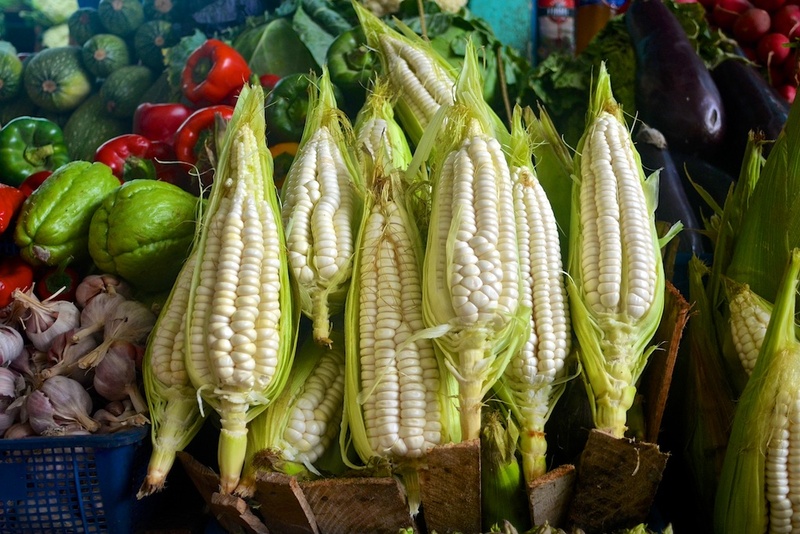 The obligatory picture of Peruvian corn. The obligatory “Bros. Tasty” picture of a head. We just love heads on platters at markets. Lunch was our first ceviche. As we rounded the corner arriving at La Picantería, Raul’s excitement was running as high as ours was minutes ago in the market at the offal vendor. After a quick stop at the bar for massive Chilcanos and Chicha Morados, we were walked past the kitchen, proudly displaying the days fish selection, and seated at a long communal table. A chalk board hung on the wall acting as a scoreboard for the reverse tally which let diners know what’s available. Fortunatelly we were the first to arrive and had our pick of the selection. Raul and Paloma had already started the spanish banter in deciding what fish we’d have and how it would be prepared. The deal at La Picantería is a two prong DIY approach. Pick your fish. Then, tell us how many ways you’d like it. The waiter joined the super fast Liman spanish conversation. Some pointing ensued. A shrug by Raul. A nod from Paloma. A glance to the kitchen and then a return nod from the waitress. With a final smile from Raul and a “Si Si” from Paloma the conversation was over. The waitress went off to start the order and Paloma and Raul looked at the blank faces on Tony and me. Translation was an exciting 4 course, local flavor, throwdown. First up was the quintessential ceviche. White fish, onion, lime juice and a little heat. Pictured at top but, hell, here it is again ’cause it was so good. Raul could barely contain himself from his tastebud fireworks display. We took turns drinking the juice at the bottom of the dish until there wasn’t a drop left. The juice is fiercely known as Leche de Tigre (Tiger’s Milk) and is so coveted they sell it by the shot for those who can’t get enough. 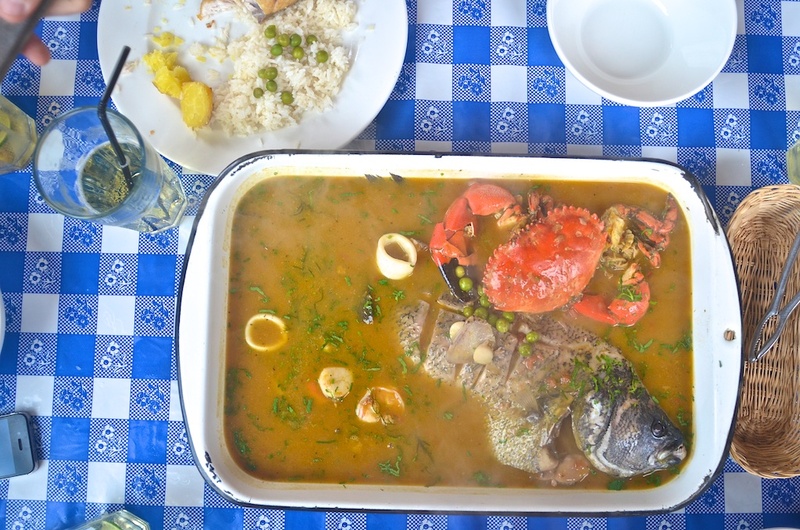 Next up was the other half of our fish.This was turned into a hot stew with some crab, squid and other seafood. In complete contrast to the ceviche, it had a deep rich flavor that melded perfectly with the fresh herbs. 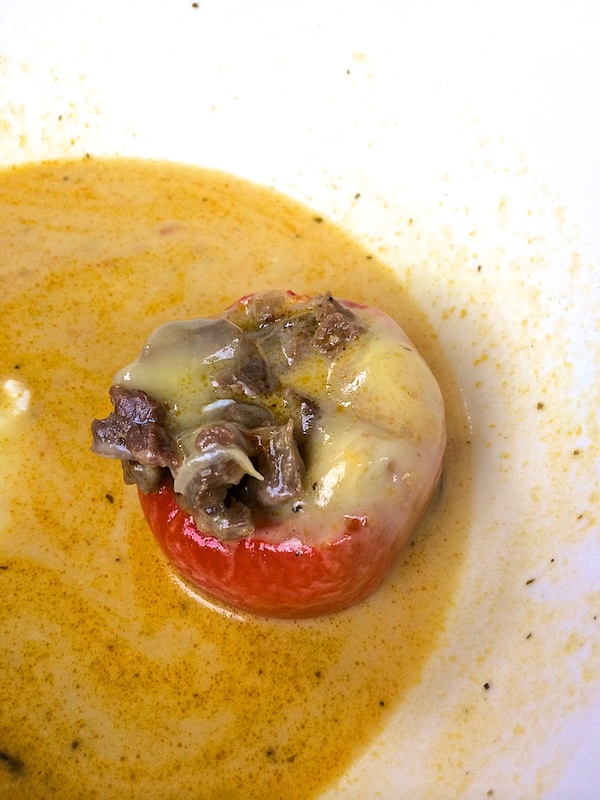 Next was the staple rocoto relleno in yet another broth. This time a bright yellow broth of beef and vegetables. Finally we made it to dessert and the simplest, freshest flan hit the table. Pushing back from the table and literally tossing in the towel after one final wipe of the lips, we would later revel that we just finished our best meal in all of Peru. Héctor Solís’ knows his fish and his time growing up in Chiclayo is perfectly represented in the food, atmosphere and service of this lunch only must-do. Stumbling out into the street we left a now completely full restaurant and very slim fish board behind us. Paloma called a cab using her mobile app. Yes they have that in Lima and it’s not only UBER. 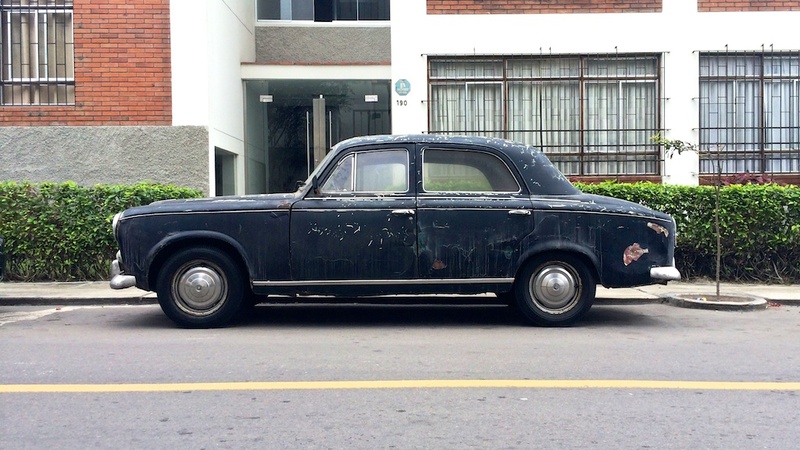 In fact, it’s the prefered way to get a cab in all of Peru. Although more stable than in past decades, safety is still a little concern in certain areas. We found the same practice in every city we visited and the locals advised we don’t hail cabs from the street. The risk is not that high but a little too often a story about locals and tourists alike being taken far out of their way hit the news. Our cab arrived mere minutes after the cell beacon summoned a driver. Once packed into the tiny vehicle, we were quickly transported from the grit of Surquillo to the sewn together, beauty of Barranco. 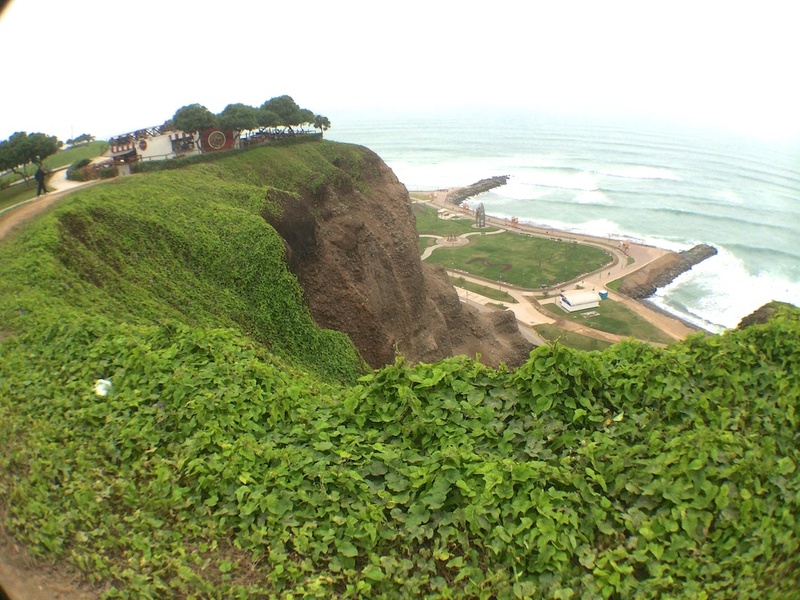 Barranco is the Bohemian neighborhood originally designed as a high end beach resort in the 19th century. Now it’s more hipster than Bohemian with cool eateries, posh boutiques and trendy design hotels. Our first stop was a pop into the beautiful Hotel B. The staff welcomed our wander and as I peeked into the lounge I found this scene. Tranquil, peaceful and historical, the room felt like it was the place ideas were conceived. 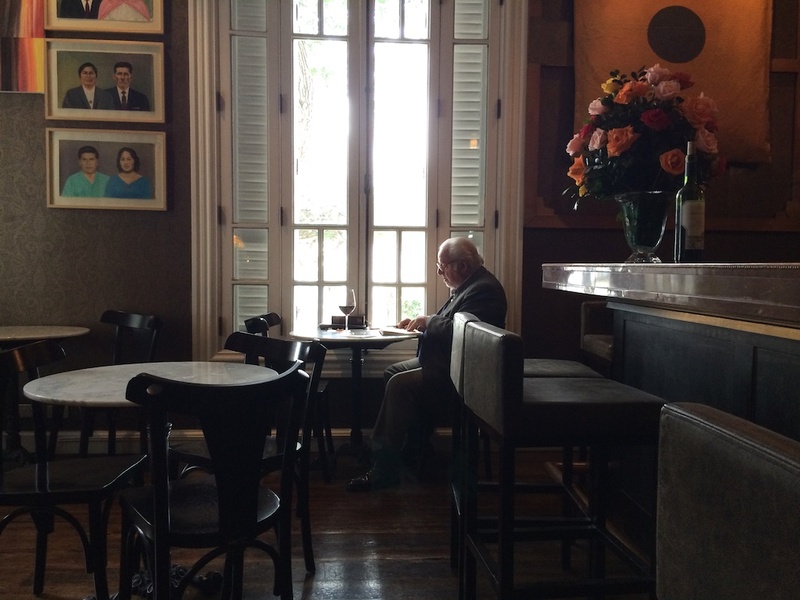 The man in the corner, older yet exuding a young energy, seemed to be contemplating a very deep thought. Off to the left a couple whispered to each other while cloaked in a single wool blanket. The grey outside the window tapped the glass as if asking to help us think, reflect and wonder. My concentration was broken by Paloma’s voice. She was outside the window, beyond the grey, pointing across the street to a boutique that curates local artists and designers. “Come check it out.”, she coaxed. Inside the shop jewelers, potters, screen printers, fashion designers and other creative makers had defined spaces each with a booth designed for their own brand of cool. The next few hours in Barranco took us through the narrow streets to the beach then back to the main square where vendors were preparing everything from anticuchos to helado Eventually we bellied up to one of the oldest bar in Lima, Juanito de Barranco, for a few cervesa. 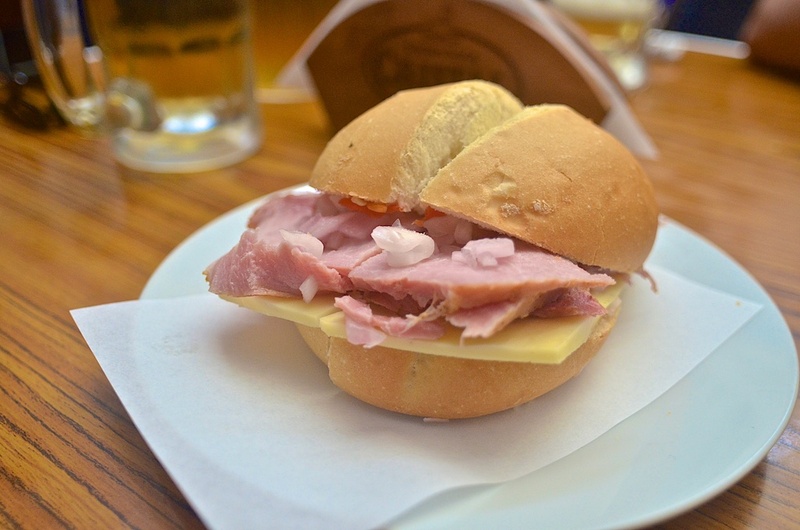 Even though we were still digesting the triple soups from lunch, I couldn’t help myself when I saw the cured ham leg next to the register., These ham and onion sandwiches are a treat usually reserved for the late night, post bar crowd when their midnight hunger creeps in but I was two beers in and there was nothing I wanted more. After the sandos we decided to head back to the hotel for some rest before dinner. We were meeting Raul and Paloma again, this time to sample the Chinese-Peruvian cuisine locally known as Chifa. The mix is what I expected. Good but nothing compared to the Chinese-Indian combos I’d get in South Asia. With bellies full of fish, noodles and MSG we double kissed our new friends goodnight and made our way back to our hotel. We were headed to Cusco the next day and needed to rest up and hydrate before the high altitudes started playing with our oxygen supply. We’ll cover that in our next Peru post. 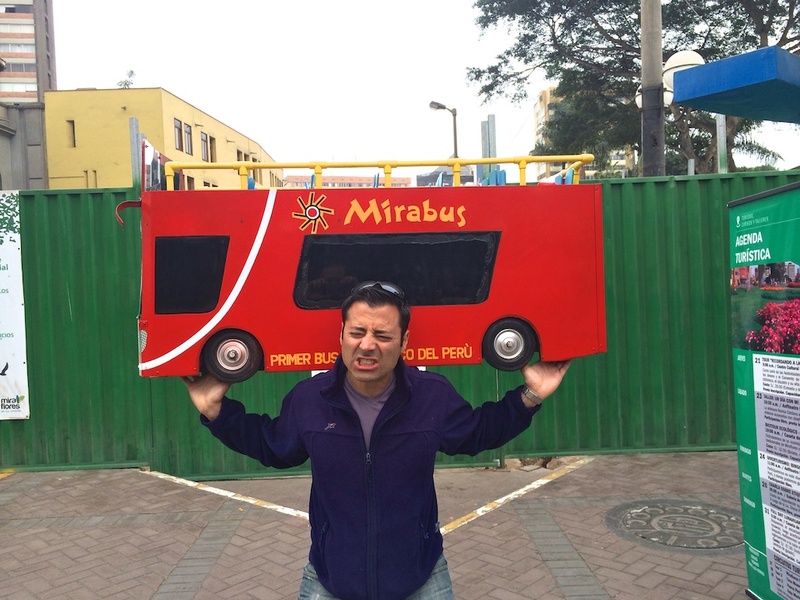 We arrived back in Lima exactly 10 days later and checked into the Hotel Sol de Oro in Miraflores. Dropping our bags, hunger from the 2 hour flight from Arequipa had us rumbling. 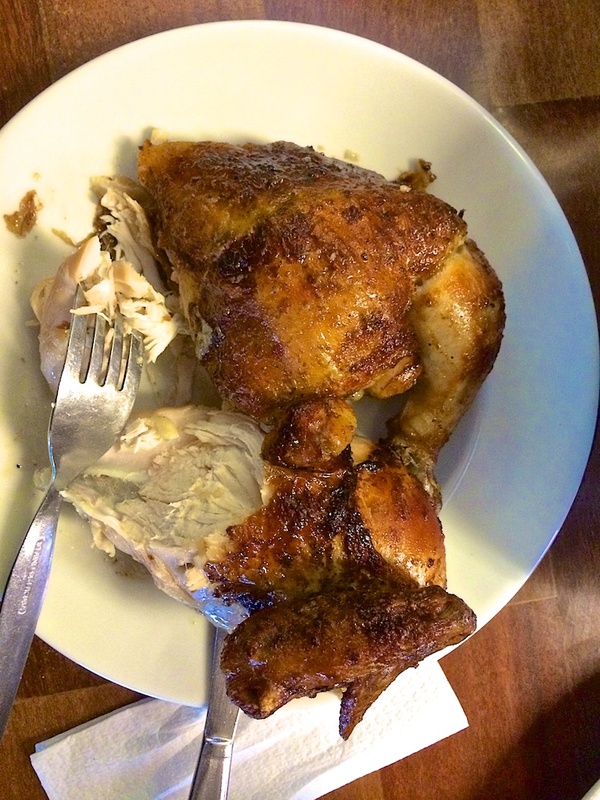 We decided to hit Pardo’s Chicken, the king of pollo de brasa joints in Peru. We thought we kept the order simple with a chicken, a salad and some fries. You have to order fries in Peru. With 2000+ varieties of potatoes not only do they have the best selection of spuds but when they fry them they’re outrageous. Well, the order came in a little steep. With a salad bowl sized for 4, an entire chicken and another salad bowl brimmed with fries we had some serious digesting to do after the serious eating upon us if we were going to be ready for dinner. The chicken was amazing even though it was from a “chain”. I say this often about foreign chicken. It’s just better outside the US. It has more flavor. It’s more tender. Pardo’s is no exception. We had limited time to prepare for our dinner at the famed ámaZ. We met up with Raoul and Paloma again. In true fashion Raoul’s over exuberant, food delight had us with a table full of Amazonian specialties. The tastes and wonder came fast. Like this giant jungle snails. This pic will give you an idea of SIZE. 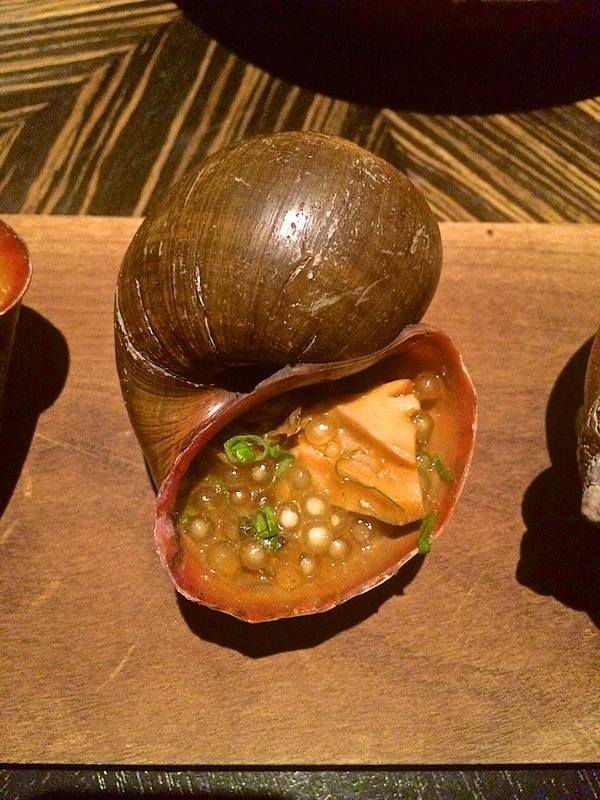 More commonly, and properly, called caracoles, these babies were filled with molecular-gastronomy caviar and jungle herbs that accented the cooked snail. The rest of the meal continued in similar fashion with each dish being stranger or bigger than the next. When we thought were were through, we still had a traditional soup course. After that we finally reached dessert which was not one but four tasty courses. A chocolate cake, chocolate mouse and a scoop of sorbet shared one plate while passion fruit sorbetto martini cocktail showed up complete with whipped crema and a frothy, sweet cream sauce. Needless to say our stomachs felt like we just ate the entire Amazon forest and we rolled home. Yet again. 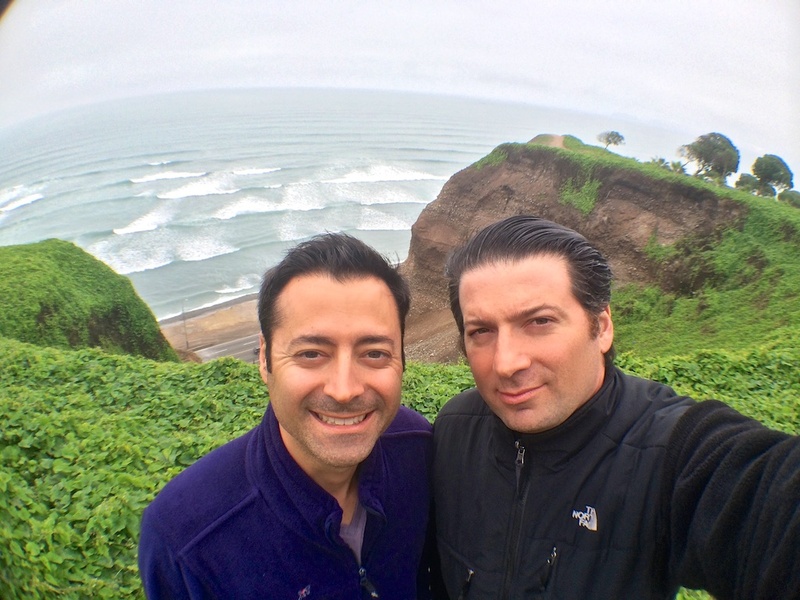 We woke on our last day in Lima, and Peru, excited to explore. Little did we know we wouldn’t get very far. 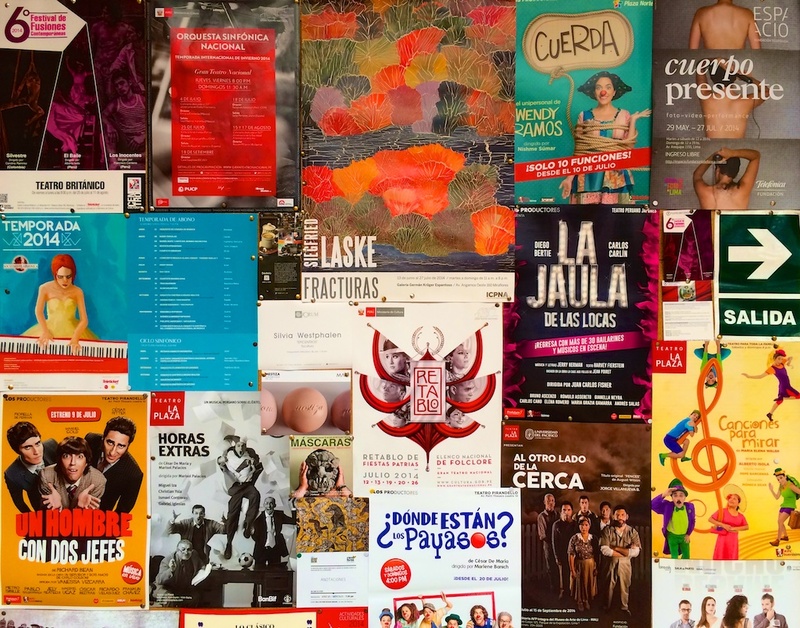 Our plan was to travel outside of the Miraflores neighborhood and hit the historic, old part of the city, check out the national museum and find some new eats along the way. As New Yorkers we decided to walk a bit before hopping a cab. Our meander stopped us at a ceviche joint. This time not fancy at all. In fact the opposite. 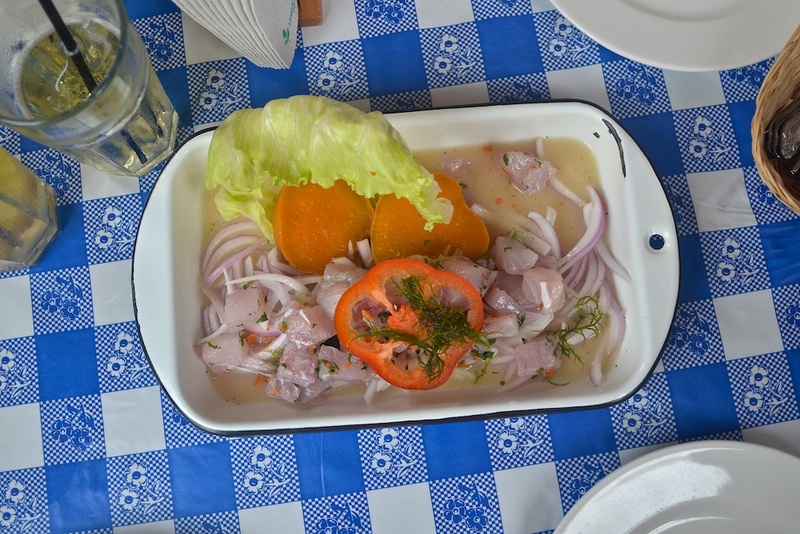 One of the many, simply, cevicherias in the city that locals frequent for a quick hit of their national dish. As the walk continued we found this little sandwich stand. Much like the “bar” process in Italy. You order up at the register and then belly up on a stool to hand your receipt to a sandwich maker. We were off the leash, wandering the side streets of the neighborhood without any of our friends, so our Spanish became increasingly worse and theirs increasingly fast. I couldn’t tell you what was in this sandwich but it was damn tasty. I do know is had some sort of sausage. Along the way Tony decided to deadlift this minibus in one of the squares we travelled through. A relic. Sitting amongst the residential towers close to the cliffs begged a few snaps from my Nikon. I titled this section (long) because it had been hours of walking and we still had not reached the edge of Miraflores. 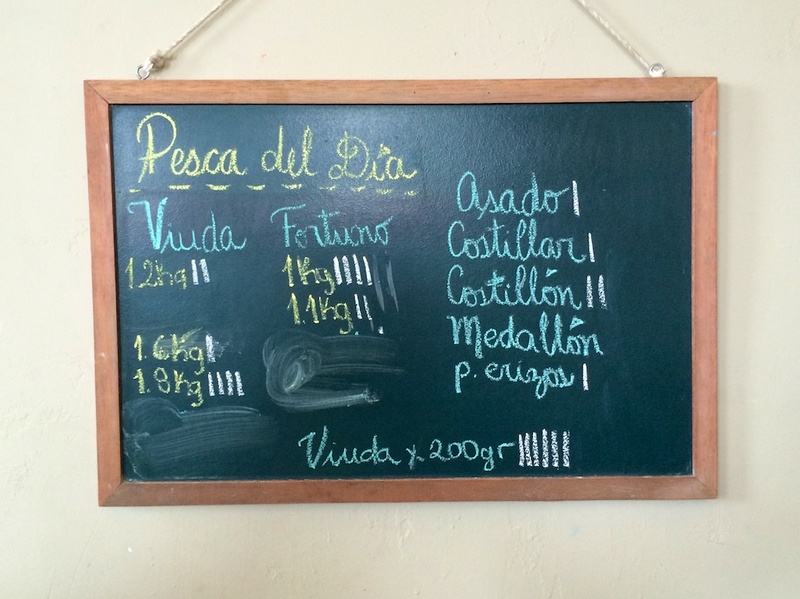 The far edge of the neighborhood lead us to La Mar, the one Gastón Acurio spot we tried to avoid. Not because we thought it would be bad but because there was one in NYC (which we never went to) and one in San Fran (also never been to). On top of that it seemed like we had better options since we were in the heart of ceviche-ville. The above dulce de leche dessert was the finale to a 4 style ceviche, self-picked, tasting. Although they were all spectacular this meal compounded our love for the simple white fish, red onion tradition. The other reason we grabbed a seat was because the famed Grimanesa Vargas shop was closed. We did get to see the sliced hearts grill ready but would have waited 2 hours for them to start kissing the flames. Soon enough we had to start the long walk back and gather up for the airport so we popped into La Mar. Not a bad conciliation meal. Hocked up on carmel sugar and citrus fish we made our way back to the coast and started following the coastal path back to our hotel. The sidewalk markings indicated kilometers and shed light on just how wide Miraflores is. We had reached the 5k mark and walked it almost all the way back to zero before we cut off to get to our hotel. The walk is fantastic and highly recommended. Alsong the way we encountered cliff side coffee shops, bridges, new residential towers, paragliders, slackliners, a BMX track, a skatepark, the kissing sculpture and tons of that green fauna you see below. As we loaded up the taxi that would take us back to the airport, the accent that marks the end this gasto-travel chapter was a final bite of one of my favorite discoveries on the entire trip. The hotel fruit dish contained a Chirimoya. This fleshy, custard like fruit is sweet and succulent. We’d had them in the highlands, we’d had them at the market and we had them at restaurants as components to dishes so, this was the perfect last bite to close the trip. Aziz Ansari goes to India like I did.